You’re not just a blunt. This isn’t a private affair after work. This is an event. You’re the Big Doobie. The Blunt Master. This is a Super Bowl, New Year’s Eve, 4/20, Martin Luther King Jr. Day blunt. Five guys threw down on this thing and they still tapped out on it before it was done. It left the curtains smelling long after mom and dad got back in town. So don’t be surprised if you end up getting passed around a little while wearing this costume––it’s not chill to hang onto you for too long. You’re legal now in some states, baby! Probably not the best choice for chaperoning a second-grade Halloween party, but it might be a hit at Grandma’s retirement home bash––you know, chronic pain, memories of the 60s and all. You might want to avoid airports. But wear your beliefs loud and proud far away from any federal law enforcement in our blunt costume! 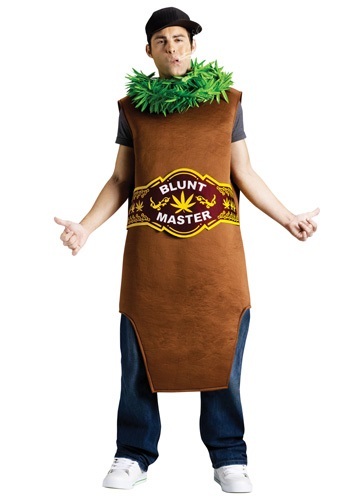 This Big Doobie Costume is 100 polyester––not smokable! You’ll have to stitch some wraps together if you actually want a blunt this big. It has a polyester brown tunic with a burgundy band displaying the unsubtle Blunt Master logo. What’s Blunt Master? You is, brah! The costume has a lei of giant (polyester, sorry) marijuana leaves that attaches to the collar with Velcro. Again, not smokeable. We can’t help you on sourcing that. But walking around in this costume probably won’t hurt in hooking up with other lovers of the herb!